The late 1920s were a brief golden age for the building of movie palaces—with an emphasis upon palace. The Fox Theater was the most elegant such palace built in the United States. This 10-story steel frame building with terra cotta sheathing fills an entire city block in the heart of downtown Detroit. 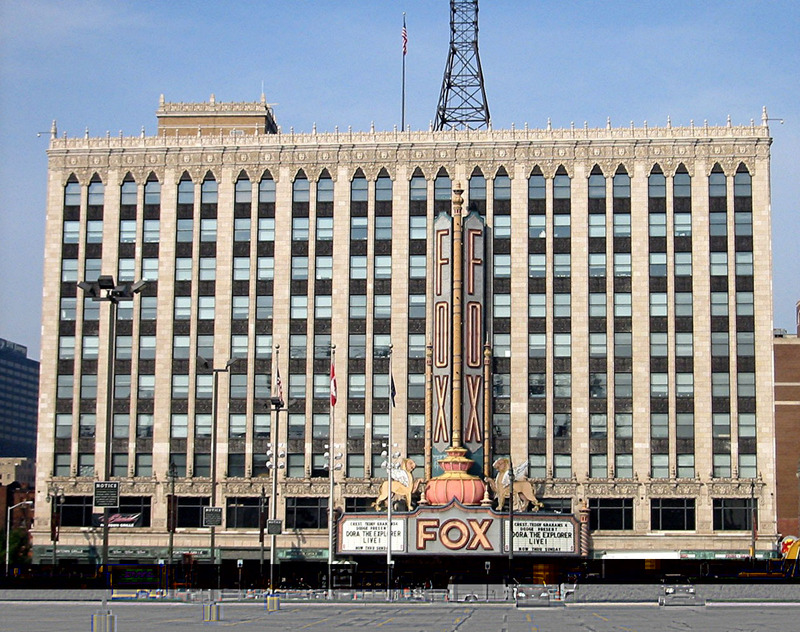 Although constructed to provide office space, the raison d'etre as the magnificent and huge Fox Theater. This was the crowning achievement of C. Howard Crane's very successful career as the nation's leading architect of movie palaces. He called upon a large number of theatrical specialists to help him design a theater that would quickly speed Detroit moviegoers away from the humdrum of their life and into a land of dreams and fantasies. Crane used a broad array of Far Eastern motifs in the lobby and the theater: Burmese, Indian, Chinese, Persian and Hindu. The lobby and the theater present a great array of deities, butterflies, lions, and peacocks along with an impressive and huge chandelier. The grand five-story lobby includes Corinthian columns and recumbent lions. The theater with its balconies seats 5,000. No theaters similar to this one were built after Wall Street crashed in October 1929 and sent the US economy into its deepest and most prolonged tailspin. The next big wave of theater building occurred after the US successfully invaded the crabgrass frontier and created dozens of huge shopping center, Northland in Southfield being the first successful such suburban center. Please compare functional and comfortable boxes that now serve as movie houses to the elegant ones that were erected in Detroit in the 1920s: The State, the National and the Fox. The Fox Theater is a great example of the recycling of a beautiful building, although it never fell into serious disrepair. The Ilitch family purchased the building and refurbished it extensively in 1997 and 1998. The offices now serve as headquarters for the highly successful Illich Holdings—the firm that owns Little Caesar's Pizza, the Detroit Red Wings (perhaps the nation's most financially successful sports franchise), the Detroit Tigers and a great deal of property in downtown Detroit. 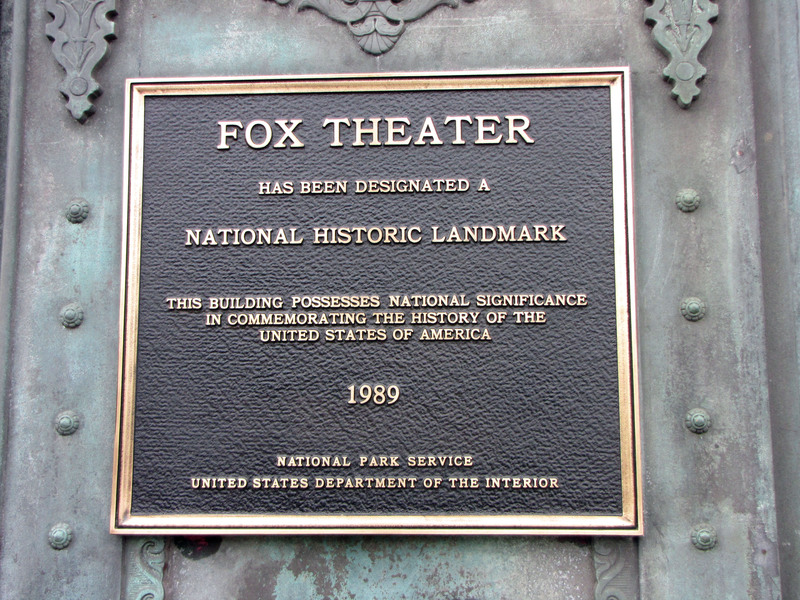 The National Historical Landmark plaque is on the Woodward face of the Fox Theater Building.